We are in the midst of one of the most dynamic periods in the history of human civilization--the commercial space era. Through public-private partnerships, as seen on the International Space Station (ISS), a new field of commercial players and entrepreneurs have introduced new technologies, capabilities and business models to the market. As these companies vy for resources to rapidly refine and improve their business models the entire space industry arrives at an inflection point. The future of commercial space will be defined by how quickly we can translate disparate R&D goals into true industrialization of space and return value to Earth-based investors. This path to commercialization can only be accelerated through collaboration, both international and domestic, to ensure that mature, sustainable business models have the necessary resources to fortify the commercial space market and create an economic boom akin to the birth of e-commerce. 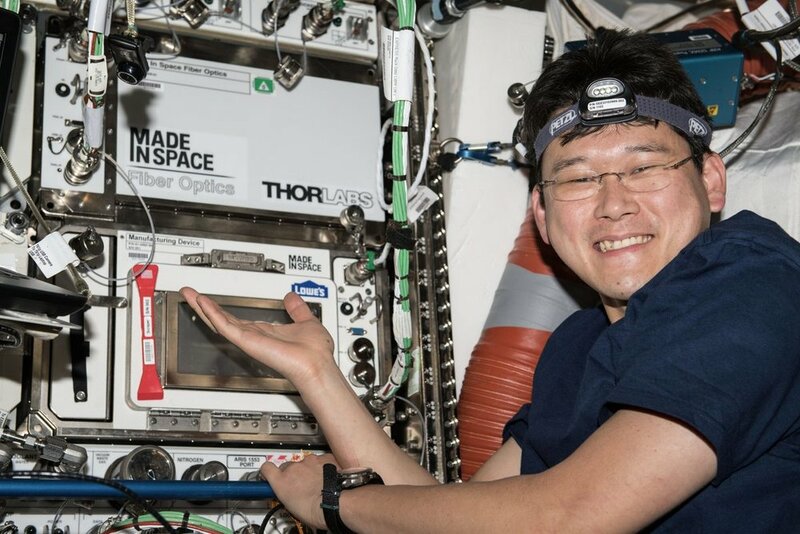 Japanese astronaut Norishige Kanai poses in front of Made In Space's Additive Manufacturing Facility (bottom) and Fiber Optics payload (top) which were installed next to each other during the company's recent fiber optics mission. It is no secret that the International Space Station is the greatest engineering feat in human history, but its legacy as an incubator for the commercial space market will hopefully rival its symbolism as an engineering marvel. Today, a range of commercial companies are leveraging the ISS to identify new opportunities, enhance their capabilities, and ultimately generate value. While these companies and pioneering technologies benefit from the support of the ISS ecosystem, they are achieving success and outlining economic opportunities in untapped markets. These opportunities range beyond commercial launch capabilities to space manufacturing, advanced robotics, satellites and other markets. The immense value of the ISS as an enabler for new commercial capabilities and viable business models cannot be overstated. The ISS facilitates affordable access to space for commercial users and serves as a technology testbed which allows new companies to iteratively test and scale their business models in space, with minimized risks, which is vital for long-term sustainability. A quintessential example of this model is evidenced by Made In Space’s own success. Through strong partnerships with NASA and the ISS National Lab, we were able to achieve a tremendous milestone by bringing the first commercial 3D printer in space to the market. The success of our initial business model propelled our company into exploring new, untapped markets. We’ve diversified our capabilities and built on our legacy of success in manufacturing in orbit by beginning to manufacture the first space enabled materials in ISS. These materials must be manufactured in space in order to be useful and can profitably produced there and then and then returned to Earth for sale and utilization. Made In Space has identified and started developing manufacturing facilities for multiple classes of materials which can scale to billion dollar markets. This industrial use of space will form the foundation for humanity’s private and profitable expansion into low Earth orbit and beyond. As NASA and the United States Congress signal an increased focus on commercial activities to set the stage for transitioning the ISS from a government-operated outpost to a hub of private-sector activity in low Earth orbit, the climate for increased collaboration in commercial space has never been better. The ISS has set an important precedent on how government and commercial partners can accelerate commercial activity in space. While there has been success for U.S.-based companies, like Made In Space, on the ISS, this collaborative model has set the table for broader participation among the global community. 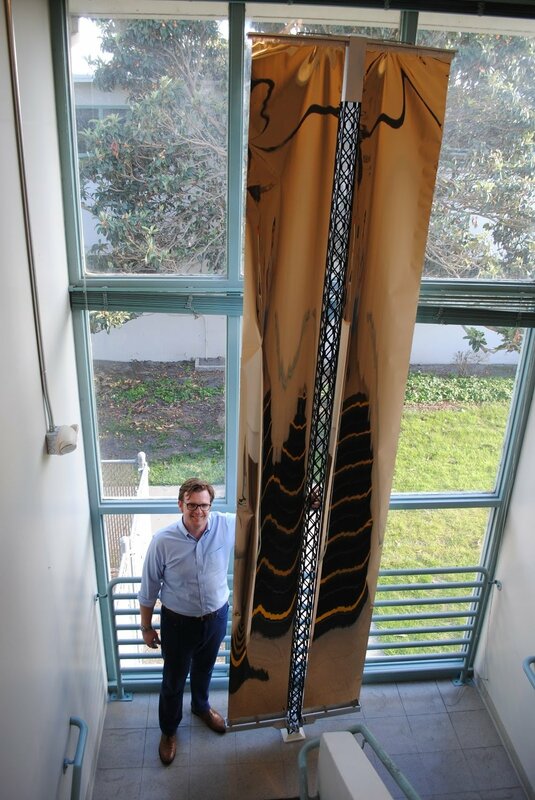 Image of subscale 3 meter mockup of an Archinaut-built solar array. Initial flight versions of Archinaut’s power system will be 10 meters long and deploy approximately 10 square meters of solar array surface area on each side, enabling the collection of multiple kilowatts of energy. Space has transitioned from an exclusive stomping ground of superpowers to an international thoroughfare. A 2017 report from Bryce Space and Technology noted that “close to 50 nations have government space budgets.” This report noted the nations that had made hefty investments (annual space budgets exceeding $1 billion) in their space programs like the United States, China, Russia, Japan, and Germany and it identified several countries that are taking measures to grow their space programs including South Korea, Turkey, United Kingdom and the United Arab Emirates (UAE). While the strategic, political and economic goals among these players are varied, the pursuit of high value economic opportunities in space is universally singular. Earlier this year, the UAE Space Agency (UAESA) announced their National Plan for Promotion of Space Investment which aims to attract investments into space activities within UAE and promote UAE investments into commercial space activities both domestic and abroad. The UAE’s inclusion of commercial space activities within its strategic efforts to expand its domestic space program is another great example of how the intersection of public-private partnerships and entrepreneurial activity is the bedrock for the long-term growth of commercial activity in space. Last March, Japan announced plans for a new initiative that would create a nearly $1 billion fund to invest in domestic space startups. This initiative would also look to match startups to potential investors. These examples signal the urgency among international stakeholders to infuse new resources into commercial space in order to tap into emerging markets. The United States has led the charge around commercial activity in space but focus by other spacefaring nations can only lead to increased opportunities for incumbents and new players. Reports indicate that private investors infused $3.9 billion dollars into commercial space companies in 2017. This a positive indicator for a burgeoning industry that is attempting to wean itself from government subsidization, but there is still room for improvement. Government support is necessary to ensure the infrastructure of commercial space is sustainable but private-sector investment will only increase if there are mature, sustainable business space based models that are delivering economic value. Commercial launch capabilities have dominated the conversation surrounding commercial space in recent years and these opportunities have garnered sustained interest from private investors. While these capabilities represent a facet of the industry, there is a clear need to elevate the conversation around commercial companies that are looking to generate revenue through products and services exclusively sourced in space. A critical question among the industry is not only how quickly and cheaply can we access space, but what economic value and untapped markets can be identified in the space environment that will support a mature and truly commercial economy? Satellites remain the cornerstone of the commercial space industry. The aforementioned report from Bryce Space and Technology estimated that the satellite industry accounted for $260.5 billion of the global space economy, which it totaled at $344.5 billion. Many national space agencies have strong public-private partnerships centered around satellite development and delivery, but there are new opportunities like space enabled manufacturing and robotics that could prove to be highly profitable. Space enabled manufacturing has generated numerous headlines as companies race to successfully produce high quality ZBLAN optical fibers in space. ZBLAN fibers produced in space would greatly outpace the performance of silica fibers currently used within the telecommunications industry. The microgravity environment enhances the production of ZBLAN by minimizing imperfections usually incurred in manufacturing techniques on Earth resulting in a superior space product. The impact of this emerging technology could be seismic. Additionally, the success of space enabled manufacturing could yield tremendous opportunities to attract nontraditional customers to the commercial space economy as products and/or services typically sourced on Earth would require supply chains that spanned into microgravity. Made In Space is leading the charge in pioneering new technologies in markets like in space manufacturing and space enabled manufacturing. We are working with government and commercial partners to develop new classes of materials, exclusively developed in space that would have a direct impact on terrestrial markets and create economic pipelines from Earth to space. We are also identifying new opportunities to disrupt existing markets within the commercial space industry through in space manufacturing. The in space manufacturing technologies that we’re developing will allow customers to develop and construct large structures and platforms in space without being constrained by the dimensions of any payload fairing. This could mean next gen satellites, commercial space stations, and other platforms all autonomously constructed in orbit. The birth of the space industrialization era is an exciting one. There are still new opportunities and markets that have yet to be discovered. The long-term success of the industry and the path to industrialization hinges on a concerted effort among the private and public sectors to mobilize the resources necessary for innovative and disruptive companies with proven business models to explore and capitalize on sustainable economic opportunities. The collective progress towards this end has been encouraging yet the urgency to accelerate these efforts, domestically and internationally, will define the era. Jeff Foust, “UAE to Establish Space Investment Plan,” Space News, January 22, 2019, https://spacenews.com/uae-to-establish-space-investment-plan/ (accessed February 18, 2019). Michael Sheetz, “Space Companies Received $3.9 Billion in Private Investment During 'The Year of Commercial Launch': Report,” CNBC, January 18, 2018, https://www.cnbc.com/2018/01/18/space-companies-got-3-point-9-billion-in-venture-capital-last-year-report.html (accessed February 18, 2019). Haylie Kasap, “The Race to Manufacture ZBLAN” UPWARD Magazine, December 20, 2019, https://upward.issnationallab.org/the-race-to-manufacture-zblan/ (accessed February 18, 2019).